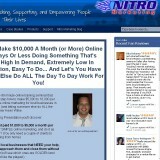 “Nitro Marketing” by Kevin Wilke and Matt Gill, found at nitromarketing.com, is a mutli-level marketing business that also acts as a direct marketing business that offers several third party internet marketing systems that claim you can make a lot of money without needing special skills. Some of the third party products include packages by Joe Vitale and several others. Some material is just no good. So it’s like a store full of products you take your chances with. Although Wilke has a decent reputation among marketers some of the products he has promoted in the past have raised concerns and some have succeeded. There is a lot of trial and error in this industry. Despite encountering few complaints about Nitro Marketing we decided to take it for a road test. After all, Wilke has had success with some runaway hits like Pure Net Profits and others. One big issue with Nitro Marketing is that there is no way to contact them on their website, only an opt-in box to get on their email list. This is where things can go wrong. Often, this list gets sold to third party clients who will clutter your inbox with loads of spam. Nitro Marketing home based business claims to be the best in the business, but strangely enough, it does not even have a phone number on the site, and many have complained it is difficult to get help any other way. Get past the hype and see that most of the stuff Nitro Marketing offers is available elsewhere for a fraction of what they charge to join, which is a minimum $25 entry and $50 monthly, for the affiliate program. We do not recommend joining the mlm side of Nitro Marketing mostly because the mlm business model failure rate is very high, and it’s even more difficult with something like this that offers no physical products like health and beauty aids. Nearly all of the products you see in Nitro Marketing are better to buy through ClickBank instead.This is a challenging product to sell, and you might be better off getting Wilke’s actual standalone training products that have had success than trying to make this work. We do not recommend Nitro Marketing.